The Twins topped the Orioles again Saturday at Target Field, giving Minnesota three straight victories for the first time since early June. Kyle Gibson was strong once again, holding Baltimore to three runs on four hits over seven innings while striking out nine, and the offense came from an unlikely source. Bobby Wilson was 2-for-3 and drove in three runs since May 14, 2016. 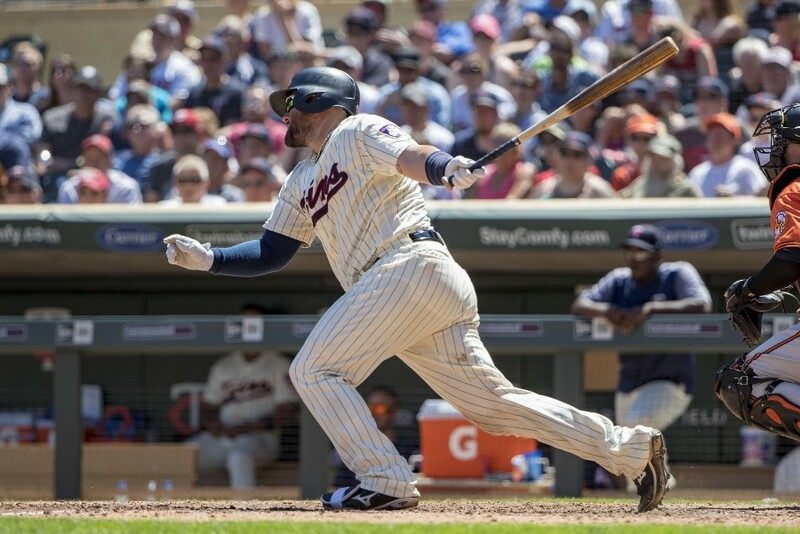 The Twins were down 3-0 before they even got up to bat, but Gibby got rolling and Max Kepler hit a solo home run in the fifth to get the Twins on the board. Wilson had a run-scoring single later in that inning and the tying run came in to score on a bases-loaded wild pitch. 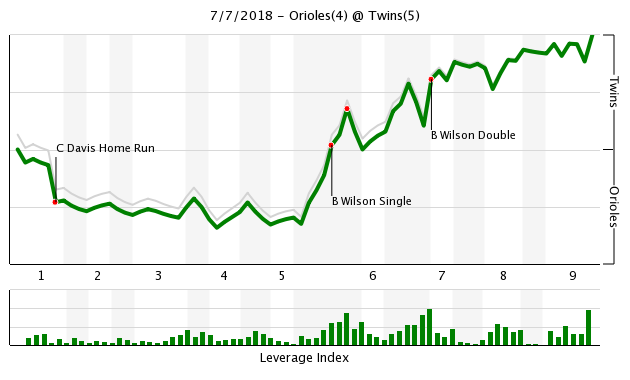 Wilson was up in a big spot again the very next inning. He hit a bases-loaded double that plated two more runs to give the Twins the lead. Oh, and Jake Cave made another tremendous catch. Trevor HIldenberger pitched a scoreless eighth inning before Fernando Rodney had a far too interesting ninth. He got the save, but it was an experience. The O’s got the game-tying run to second base, but Rodney got Tim Beckham to ground out to earn his 19th save. Gibson hasn’t given up more than five earned runs all season, and this was his 14th start in 18 times out in which he’s surrendered three or fewer earned runs. I'm sure people were again selling out on Gibson after the first inning. Keep the faith. "Cut with the negative waves, man." There really needs to be an additional stat for the FRE and posthumously for the EDEE. Not all saves are saves. If the closer comes in with a clean slate with no one on base, and a 2 or 3 run lead, and they give up a couple hits and a run and get the third out with a runner on second that he is responsible for, that isn't a save, that is an "escape". If he comes in and gets puts them down without having the lead threatened, that is a save. Today, that was another "escape". Only deal Gibson if the price is very good.He has been very good from Late 2017 till now! I'm enjoying the fantastic catches by Cave. Duke, Belisle, Rogers and Magill have thrown a combined 21 pitches in the last 5 days. At some point, either MOY needs to use these guys or at least one should be replaced by a position player. Gibson is our #2 starter right now. You don't deal a #2 unless you get something great in return. But I don't see us trading him. Our pitching is a stiff wind away from finding out just how solid it is. Odor and Lynn don't inspire me, but they are suitable 4 and 5s. Romero was the 2 or 3 I thought. I want to see if Gonsalves can be a starter in the Show. If he can, I'd trade Lynn, or Odor, but not Gibby. Hey, if the Twins can run the table before the All-Star break, maybe they can get back in the AL Central race. Why not us? I would love to celebrate the great series, the streak, the pitching, but I have been following this team all year and after reading Eric Karabell on ESPN today I can only say, at least we beat the team we should beat. "I got a closer look at the brutal Baltimore Orioles this week and they look every bit the 100-loss team they appear to be. What is surprising to me is how this lineup, even with awesome infielder -- NO, I'M A SHORTSTOP -- Manny Machado in it, has been so bad. I actually cut second baseman Jonathan Schoop in a rather deep league earlier this week, despite the fact he was one of my offensive building blocks a mere three months ago, coming off a 32-homer season in which he batted .293. Why would we not rely on this fellow? It takes a village, or something like that, to have a .282 winning percentage in July, so here are one writer's thoughts on the disappointing Orioles, um, village." The Twins are a better team with Polanco at SS, Esco at 3B, and a good fielding catalyst in CF. I'm excited to have Polanco back at SS and I have enjoyed watching Cave start in CF. Because the Rays swept us the last time we faced them and we lost the last series to the Royals too. It's great that we can get our hopes up beating up on the league's worst team, but we'd do well to remember that Baltimore is on a pace to lose about 120 games this season. Not sure about your 1-3 ranking,I think Gibson, if he's not traded will challenge Berrios to be the ace fo the staff. Yes Berrios has a lot of potential but he still has a lot to learn.Romero? Lots and lots of potential but he's still in the group of Slegers, etc until he shows he can get it done. romero is not in the Slegers etc category. Kyle Gibson’s trade value is 0% impacted by his ranking in our rotation. That ranking is utterly irrelevant to his value to anyone, including the Twins. What makes him valuable is team control and play on the field. Orioles have averaged fewer than 3 runs every 7 innings, which is what they got off Gibson today. Baltimore has now scored 50 fewer runs than the Twins...with two more games played. Close your eyes for a moment, envision the typical Twins lineup and performance this year...and then contemplate a team being WAY worse offensively than that. That’s the 2018 Baltimore Orioles. I love that the Twins won. Thrilled! I love that Wilson has probably as many RBI as hits. (Sarcasm and humor folks). And he may be a great guy and good defensive catcher, but overall, he makes Butera look like Mauer at his prime behind the plate. Maybe we lose today without his hit, and Garver behind the plate instead. But when does a losing team play for the second half, development, and 2019? The more I watch Cave, the more impressed I am. Maybe the elite fleet footed Buxton makes a couple of those catches look "easy". But none of the plays Cave has made are easy at all for normal mortals. He has the chops to play a quality OF. Keep playing him daily! He may surprise. He may be a quality 4th OF. But he shows ability, potential and LIFE when he plays. The OLD Gibson may have shut down after a tough first inning. He responded with 6 shut out innings after. (Don't give me the "it's only Baltimore" crap.) He is the Twins second best SP, and the best 3-6, 3.59 ERA hard luck SP in MLB. There is no SSS any longer. Unless you are overwhelmed, you keep him. "I can't believe I didn't have Bobby Wilson on my fantasy team." The win is nice and all, but I am terrified that this game will be a catalyst for more Bobby Wilson. Bobby Wilson made the case for not playing him.Hitting matters more than Garvers negative defence.How many game might we have won with Garver hitting.Wilson proved it himself that he needs to play every 3-4th game.If Wilson goes 0-4 we loss.I've seen that too many times before with Wilson. You've got to score runs in the American League.Wilson would do fine batting 8th with a National League team. I'd feel good about their chances if they played Baltimore and KC 75 more times... Alas. First of all, play on the field is the most important thing, but good play always means you are higher on the pecking order. And the higher you value your pitchers the higher the asking price. So you will ask more for your #2 than you will your #4. And I don't believe for a second that other teams don't give consideration to where the pitcher is on your rotation's pecking order. Teams also know whether they need a #3 or #4. They trade to try to fill those holes. These are people, not robots. Analyzing them as if they are fungible commodities and elevating control or arbitration eligibility isn't the most important thought about what builds a winner. You need to see the whole picture. And a guy who is a leader and good teammate is going to be in demand much more than a meathead with two years of team control. Who cares if you have control if the guy is a cancer in the clubhouse? And I have had players with a million dollar arm and a two bit brain. You don't value the arm as much as you otherwise would, because of the brain. This is why guys with attitude problems don't get many calls while guys who are winners are in demand. Time under control is a mere secondary consideration. Its nice to have control, but who cares about control if he is not good for your team? Your trading partner has to want the pitcher in the first place. Morris was saying that the coaches and pitchers like Wilson because he calls a good game. That is part of the game that we don't get inside info on, so I was glad to hear at least one reason why Wilson is playing. Castro is the starter when he is back, so it will be interesting to see if the Twins are open to bringing in a #1A catcher, or if they will muddle through with a committee approach. First of all, play on the field is the most important thing, but good play always means you are higher on the pecking order. And the higher you value your pitchers the higher the asking price. So you will ask more for your #2 than you will your #4. And I don't believe for a second that other teams don't give consideration to where the pitcher is on your rotation's pecking order. Quick....see what the price tag is for the #1 in the Orioles rotation!Then we'll have two aces! Where a dude lines up in your rotation is relative to the talent on your roster. The Yankees don't care where Gibson ranks in our rotation, they care about what he would add to their team on the field and how long he would add to it. Where you are in a team's rotation is relevant to your team, sure. But it is also relevant to whether the OTHER team even wants you. Nobody is going to come calling for the Twins #5 or the Birds' #5 down the stretch. They are interested not specifically by where you are in the rotation, but where you are in the rotation speaks to your ability, and hence value. My point is, if you need to add pitching, you don't trade away your #2.